Mom says, "Let's Hear it for the Laurie Berkner Band!" 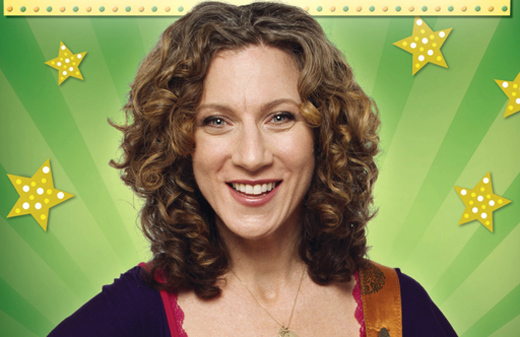 If you have a kid and a TV, you must know Laurie Berkner. The perky singer makes children's tunes slightly more bearable for adults, with her adult contemporary sound. Even better, the kids just love her. Paramount has just put all of the band's Nickelodeon jams onto one DVD, titled Let's Hear It for The Laurie Berkner Band! It's actually a 2009 Nickelodeon special of the same name, but you (or your kid) may recognize some of the shorts from the cable channel's pre-show entertainment or as some of the filler for Jack's Big Music Show. We got a hold of a copy of the release, which is out Tuesday, September 28, 2010. At 44 minutes, the disc includes the band's greatest hits -- all of which are extremely peppy. The disc is pretty no frills, but that's certainly some of the charm. It took my kid one song to realize what the heck was going on, and then he busted out more moves than Electric Boogaloo. It's truly a workout for the body and facial muscles. Expect to see a ton of smiling! In between the disc's 16 songs (see below), Nick cartoon hosts Moose and Zee make with some mild chatter, allowing your kid to catch a breath. This should be a real winner with the kids, and warrant some serious repeat viewing. Instead of trying to catch snippets of Laurie on the cable channel, think about investing in the DVD. Amazon currently has it for $3 less than it's $16.99 MSRP. "Farm Song (That's What I Did On The Farm)"
"I Really Love To Dance"
"I'm Me And You're You"
"Fast And Slow (The Rabbit And The Turtle)"